Tulle-skirted outrigger paddlers formed a guard of honour for their teammates running out of the water and up the beach after a race. Young mates took to a giant inflatable; floating on the turquoise water, complete with stocked esky. Defence force personnel from around the world enjoyed some pre-RIMPAC R and R.
Local families nabbed early beachside positions under shade shelters, bringing with them enough food and bevvies to last until the 8.30pm fireworks. In my family, the two surfers each hired a board and paddled out to the reef break. My two sons played paddleball together on the sand. Despite the massive crowds, Fourth of July in Waikiki was looking mighty fine from my position, gently bobbing on the lagoon-protected water in my $8 pink, Hibiscus-flowered ring. It’s safe to say that during our 10 days on the Hawaiian island of Oahu that I perfected the art of bobbing. It’s all quite meditative, hanging in crystal-clear water and watching the passing parade that could at any time include other bobbers, stand-up paddle boarders, snorkelers and turtles. I did not make that last bit up. More on that below. 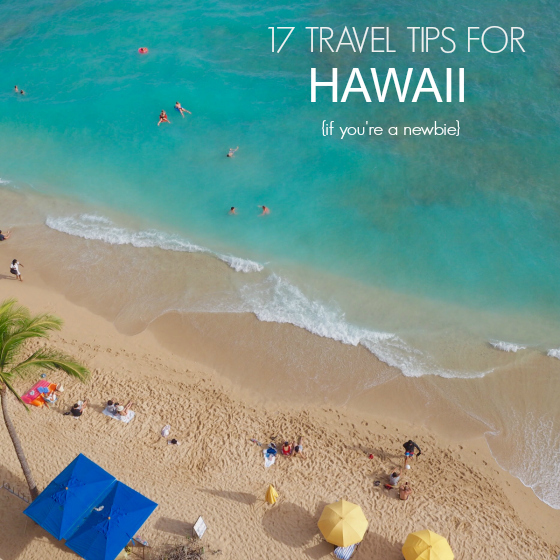 Also below, I’ve listed out my 17 tips for travelling to Hawaii if you’re a newbie. We were newbies this time but we are already planning our return trip. And yes, we’ll venture beyond Oahu in future visits. This visit was to celebrate our son’s 21st on the Fourth of July before he and our daughter continued their travels elsewhere. 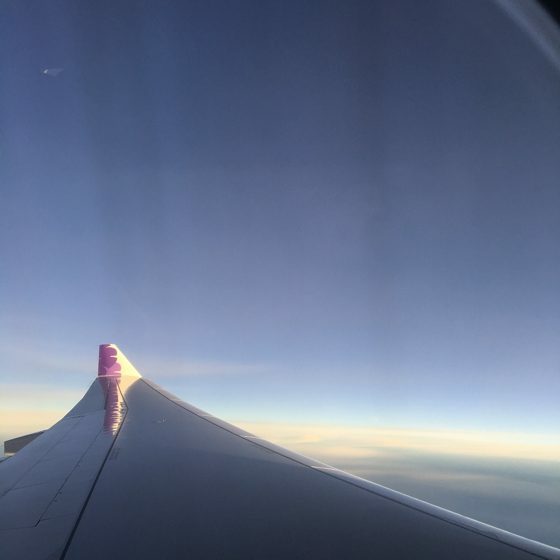 We flew Hawaiian Airlines and can highly recommend them, particularly if you’re fond of packing ALL the things and/or shopping for ALL the things. Each of us could have taken two 32kg suitcases. We didn’t – and my suitcase going over was only 18kg – but we did take with us an extra small suitcase to swallow up any purchases. Glad we made that call. Hawaiian Airlines flies direct from Brisbane and the flight was about nine hours. We left in the evening and got to do that day all over again on the way over. We were tired as sleep was not plentiful but it didn’t take too long to get on Hawaiian time. Coming back we lost that day but flew during the day, arriving home early evening so were able to fall into bed pretty quickly after a little unpacking. The only downside to the flight was the inability to request a gluten-free meal. When we started planning our family trip about 12 months ago, we were mindful of two things: we were travelling across the busy Fourth of July weekend and we were a party of four adults and one child. 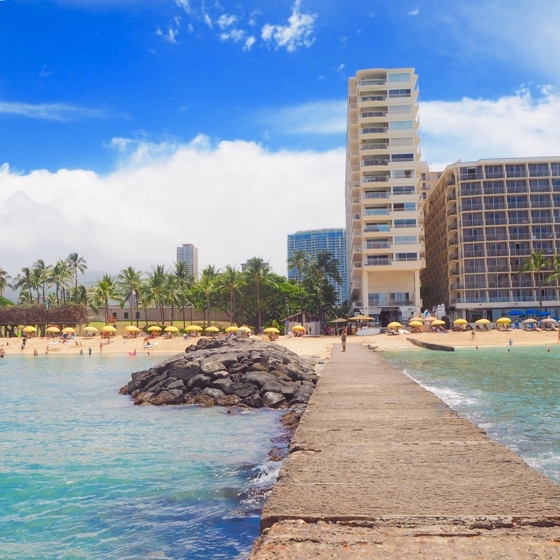 Finding an apartment seemed like the way to go and a little searching on Last Minute lead me to Outrigger Waikiki Shore – the only apartment building on the beach at Waikiki. 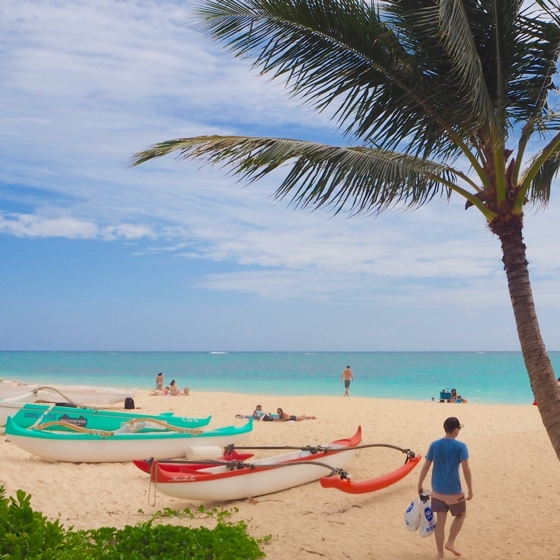 We wanted to be staying in the thick of things and this choice proved fantastic for that but with a slightly more chilled element than other parts of Waikiki. Our two-bedroom apartment included a super comfy king-sized bed, two singles and a sofa bed in the living area. A ceiling-mounted timber room divider separated the main “bedroom”. There were two bathrooms (a laundry included in the main) and the kitchen was large and well appointed. The building itself is quite old but each apartment is individually owned, so you are at the mercy of that owner’s décor taste. Housekeeping changed towels every day if you needed and sheets every three days. What made the accommodation a winner for us was the ability to self-cater most breakfasts (there are “variety” ABC stores everywhere for everything from deli goods to booze – at such good prices we questioned why we bothered with duty free purchases, Hawaiian shirts and sunscreen) and some lunches, the amazing view from our balcony and the relatively quiet beach on our doorstep. 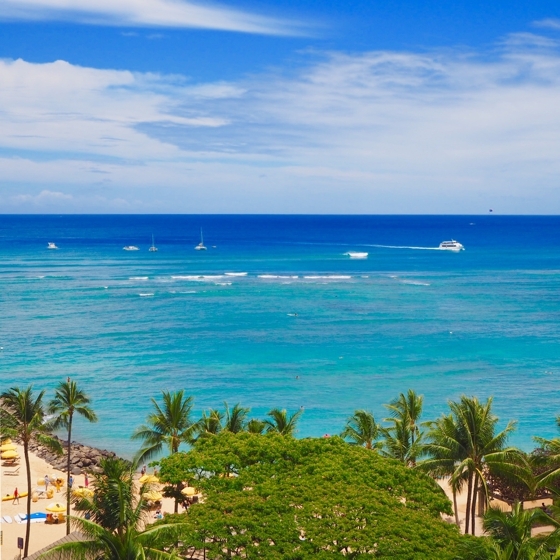 All apartments face towards the Hilton Hawaiian Village complex and, with the Fort DeRussy Beach Park and military reserve next door, the view from level five and above is priceless. You don’t need to leave your apartment to watch the sunset or the Friday night fireworks. 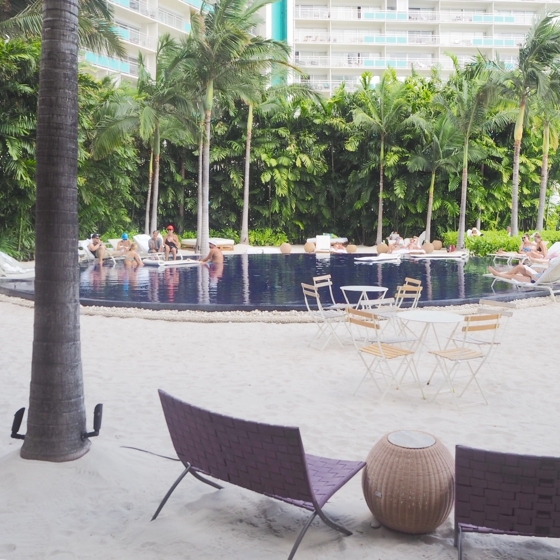 You also have access to the pool and facilities are the Outrigger Reef next door. We preferred the beach to the pool though and didn’t spend time there. We had heard while there that the entire complex was being redeveloped but have since found out it is only the Outrigger Reef hotel that is being redeveloped in the next 18-24 months. Outrigger Waikiki Shore will not be touched. 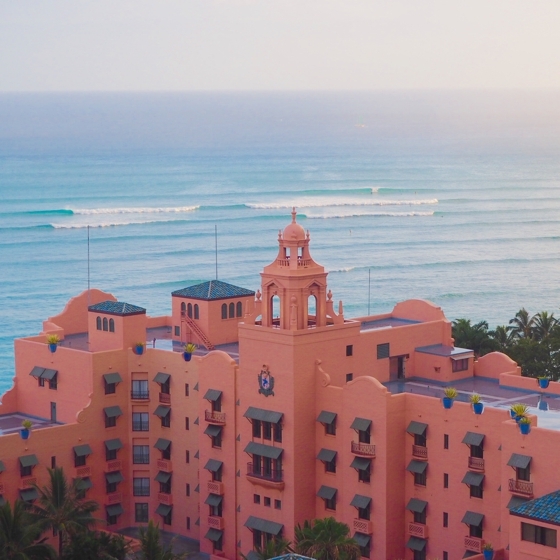 In the Outrigger Reef complex, only the small, five-storey Diamond Head tower at the Outrigger Reef is expected to be demolished as part of this revamp. Both the Ocean and Pacific towers will remain. 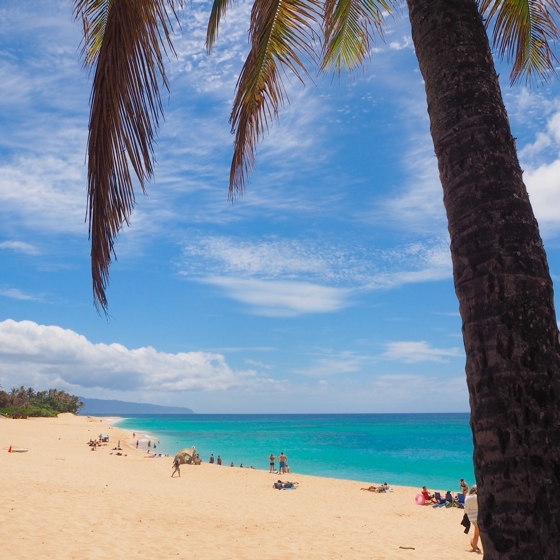 Where would I stay on a return trip to Waikiki with just the two – or three – of us? We fell for the charm of the Moana Surfrider for lots of fun right on the main beach at Waikiki. 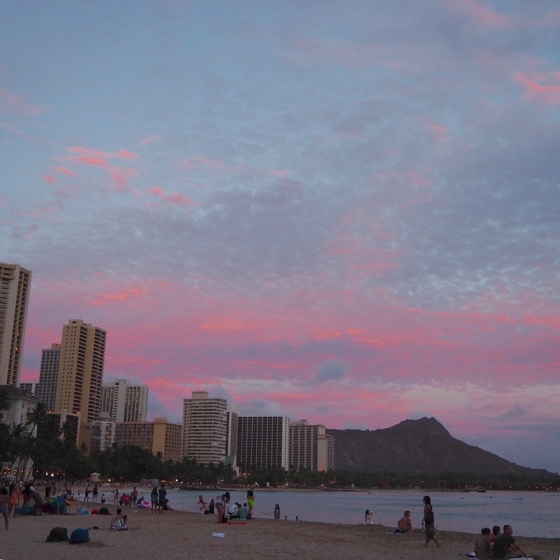 I also was taken by The Modern Honolulu – its location is a little further away from the main Waikiki area though. When we travel I always like to sort a few things in advance and balance that out with some winging it and going with the flow. The busy time we were travelling in (and the fact we were travelling as a party of seven) meant I did err more on the pre-organised stuff but I purposefully didn’t fill up every day with a pre-booked activity. 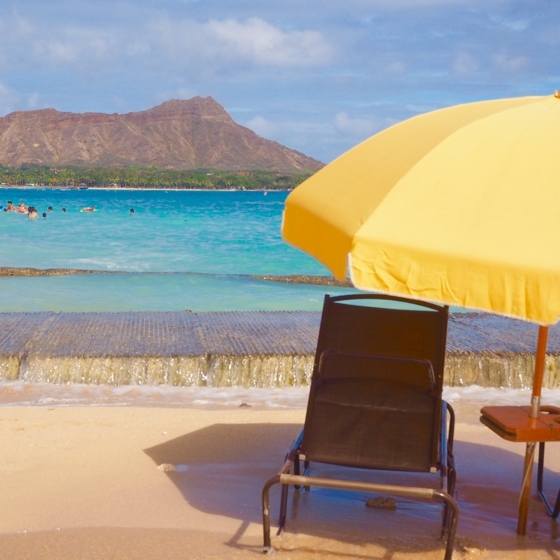 Relaxation was the top of everyone’s agenda for our time on Oahu. 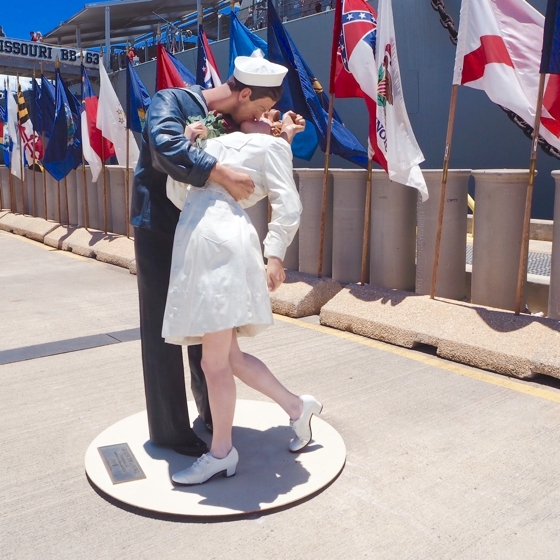 What we did book was dinner for the Fourth of July (absolutely didn’t want to take our chances on this special occasion); airport transfers; Pearl Harbour tour; car hire; sunset/fireworks cruise and a spa visit. On arrival, I booked a dinner and lunch at restaurants where it may have been more difficult to get a walk-in spot. Mr SY and his Dad are self-confessed war/plane nerds. Pearl Harbour was always going to be on the agenda. What I didn’t expect was how much I enjoyed the morning of reflection. 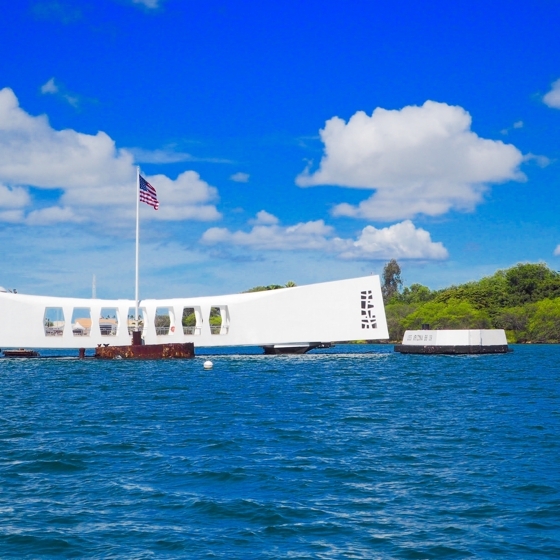 The USS Arizona memorial has been created so beautifully and with so much respect for the history of the place. 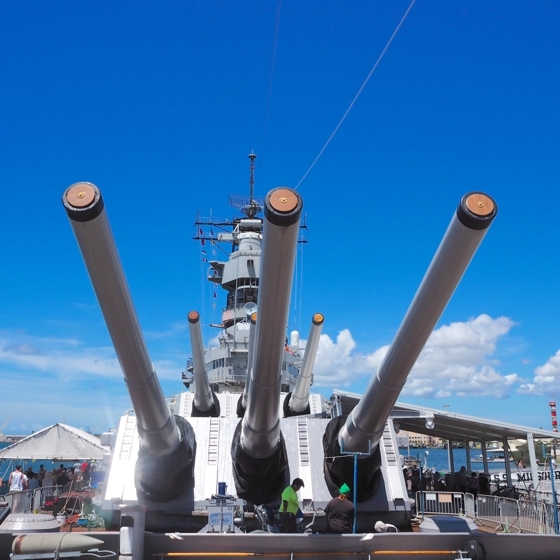 On the USS Missouri, I thought it would be inappropriate to make reference to Cher’s If I Could Turn Back Time video clip but, no, the tour guide beat me to it. We booked this tour through Discover Hawaii Tours. If you do as well, I hope you get Kenn as your driver. Kenn’s a native New Yorker and Vietnam vet who moved to Hawaii 40 years ago. Think Morgan Freeman with House of Cards’ Kevin Spacey’s voice and a wry humour which had us in stitches. OF COURSE. 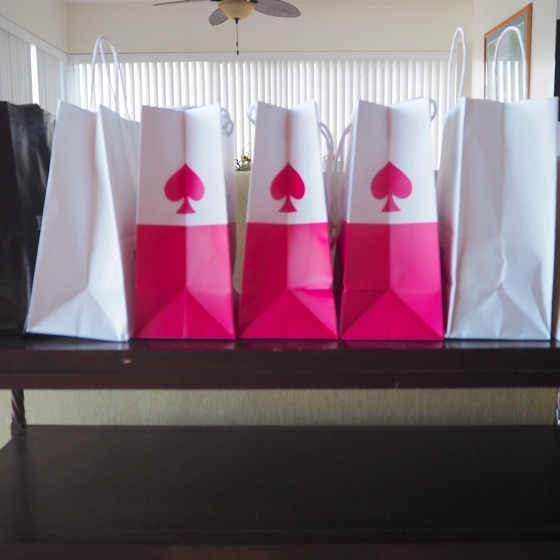 It goes without saying that any holiday of mine involves a little shopping … and a little bit more. Many who have shopped Hawaii before me told of a hit and miss situation when it came to nabbing bargains. I can tell you that our experience was very much on the hit side of the equation. A lot of that had to do with the Fourth of July sales we landed smack bang in the middle of. This meant that the outlets at the Waikele Premium Outlets were offering up ridiculous discount situations that my non-maths brain struggled with. Luckily attentive sales assistants did the calculations for me. Kate Spade and Michael Kors yielded most for me. The boys cleaned up at Adidas and Tommy Hilfiger. 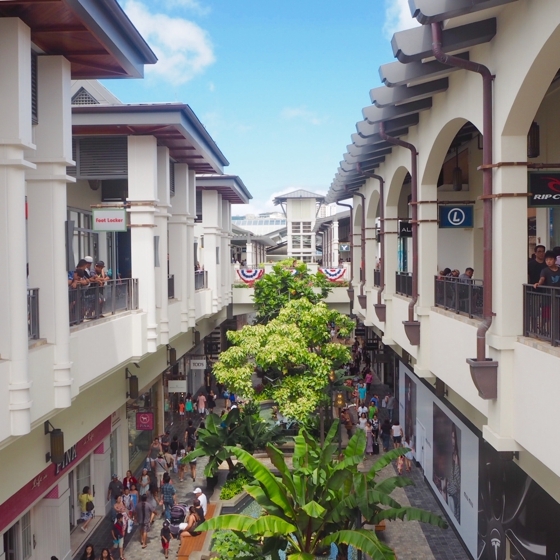 Aside from the outlets, the Ala Moana shopping centre (think indoor/outdoor like Gold Coast’s Pacific Fair) offered up excellent value across the Fourth of July weekend. A long list of shops offered 25% off; others had 40% off. In Macy’s department store, the reductions were on top of reductions. Make sure you stop in at Nordstrom … there’s a bar smack bang in the middle of the womenswear section. And, of course, there’s Anthropologie. 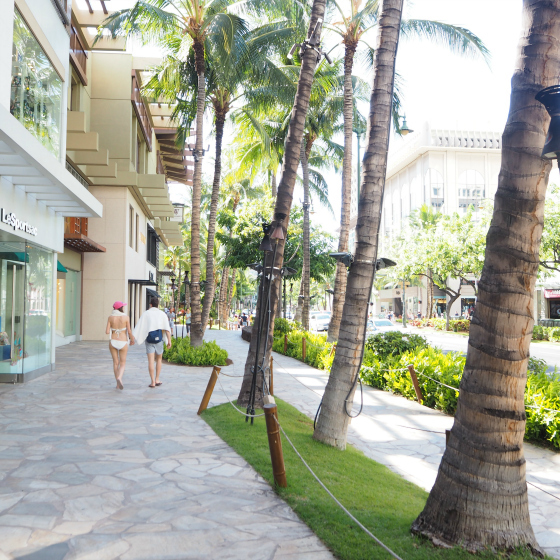 Downtown Waikiki also offered up fun shopping opportunities. Loved Sephora and Tommy Bahama. 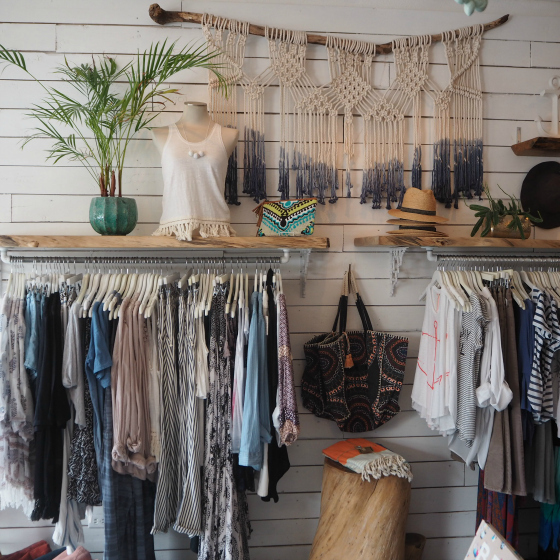 Less on the bargain front but more filling my need to hunt down interesting shops and boutiques, was a few finds I discovered on the east coast of Oahu in Kailua – loved Olive (and Oliver); Global Village and SoHa Living. I am nothing if not predictable. Always on the top of my holiday/escape list is a trip to a day spa. I call it advanced relaxation therapy and that’s what I found at Lather Spa at the Modern Honolulu. Let’s just talk briefly about The Modern Hotel. This boutique hotel exudes a cool factor from the moment you enter. We dined first at Morimoto (see below) before I sent Mr SY on the 20-minute walk back to our apartment while I hopped in the lift up to the spa. I’d booked in for an 80-minute Modern Harmony Massage (always a good idea to try the local signature treatment I say … much like the local drink). This was a delicious drool-and-snore-inducing mix of shiatsu, Hawaiian Lomi Lomi and warm stone massage techniques. 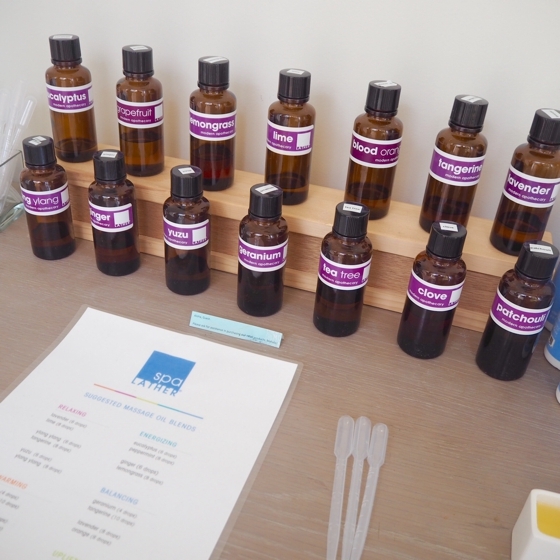 It started with my therapist creating a signature aromatherapy blend at the essential oil blending bar and ended with me lamenting that it was all over too quickly. This was quality massage therapy in a luxe location. I’ll be going back. I think it’s important to assimilate oneself with the environment in which you find yourself when travelling. Me? I like to adopt the “local” drink. Last year I was all about the Aperol Spritz in Italy. This year, I became a self-appointed Mai Tai aficionado. I thought to be a true aficionado I should sample as many Mai Tais as humanly possible in 10 days. This wasn’t about binge drinking. This was about quality control and rating the best in Waikiki. 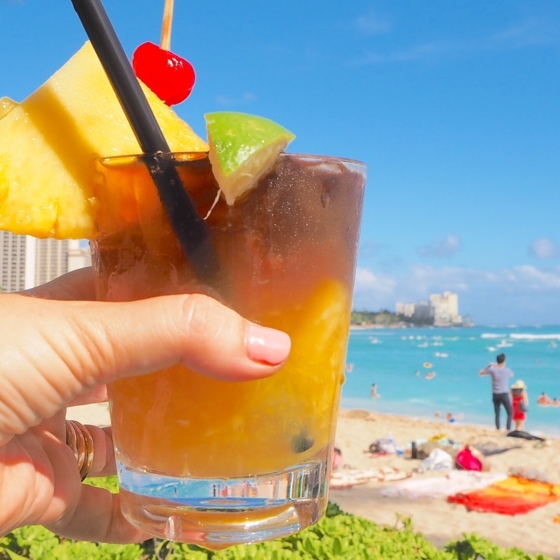 The Mai Tai actually originated in California but when its inventor was asked to create a drink for the Royal Hawaiian Hotel, adding the variation of pineapple juice, it became Hawaiian folklore. 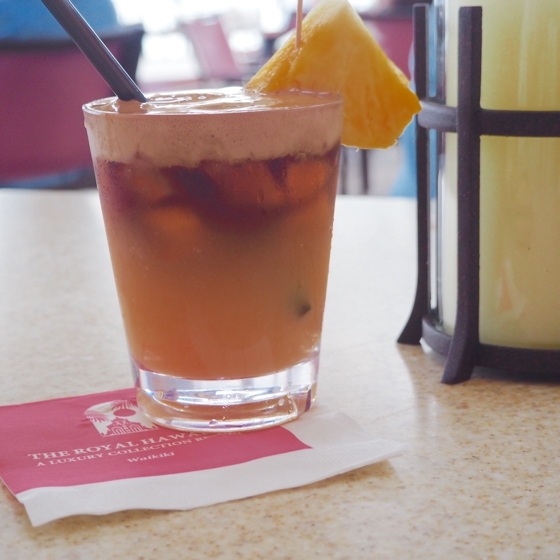 At a very basic mix (and one that was served to us on our sunset cruise), it’s a matter of whacking dark rum into a cup with ice and filling with pineapple juice. 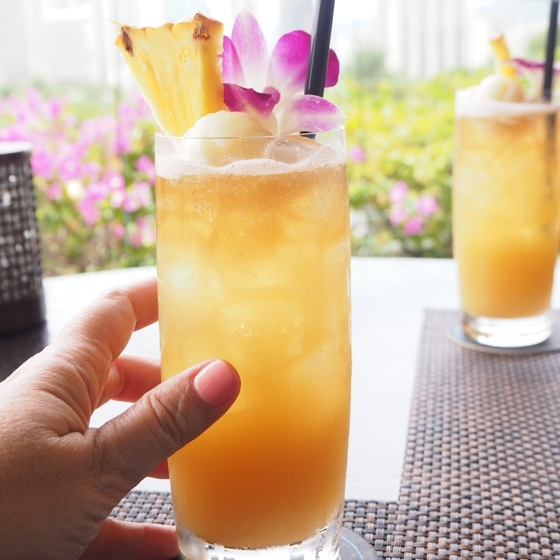 At the fancier end of the Mai Tai spectrum, I experienced additions of crushed pineapple, a ball of sorbet and an ice-blend that came with a shot of more rum on the side to pour in. Expect to pay anything from $US2-18 per Mai Tai. And here’s a recipe to try at home. 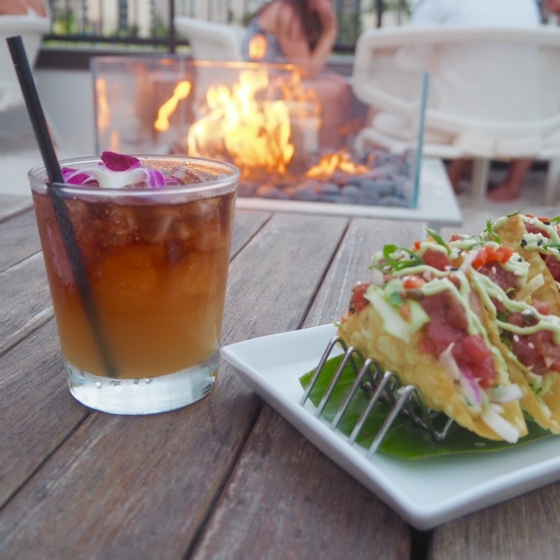 We most definitely took advantage of the beachfront location to scope out and road-test beachfront bars but like most urban places around the world, Waikiki has embraced the rooftop. Sky has to be hands-down the most dramatic with views to Diamond Head, out to sea above the Royal Hawaiian, to Honolulu and the volcanic ranges behind. For atmosphere, take two levels above the street to the Tommy Bahama roof-top bar where you can kick your shoes off and rest your feet on the sand. 11/10 for the bar snack situation. 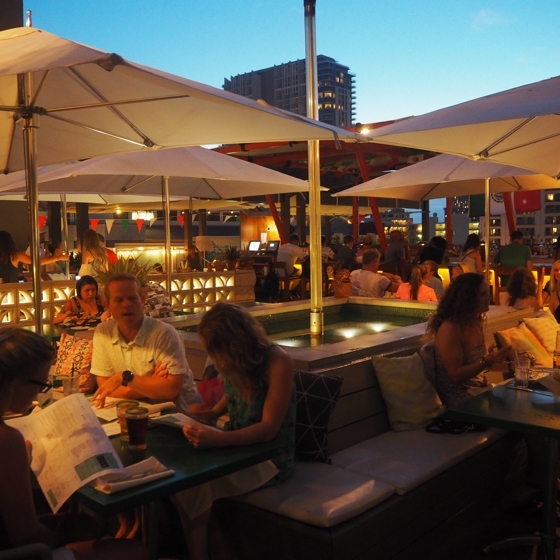 Buho Cocina y Cantina was not only a fab rooftop destination but also a great dining option. Authentic Mexican, excellent margaritas and a setting with a great vibe made for a memorable night out. 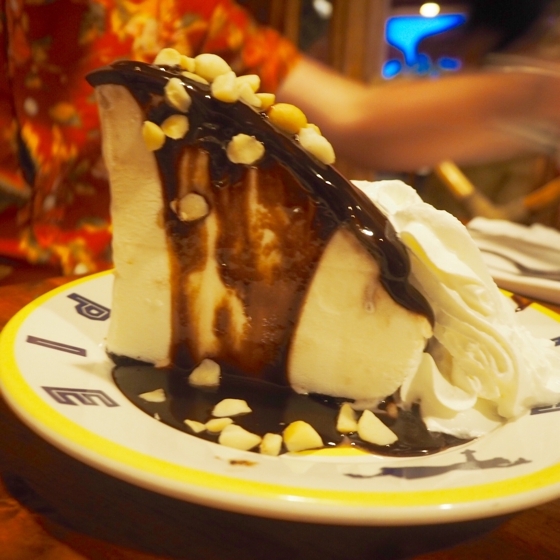 One of the questions I’ve been most asked was how expensive it was to eat out in Waikiki and my answer has been, “as expensive as you want it to be”. We did what we usually do on holidays and opted for a variation of high-low dining options – from self-catering in our apartment for most breakfasts and some lunches to buying from the nearby food trucks and treating ourselves big time at Nobu (we sent the kids to Denny’s Diner that night!). 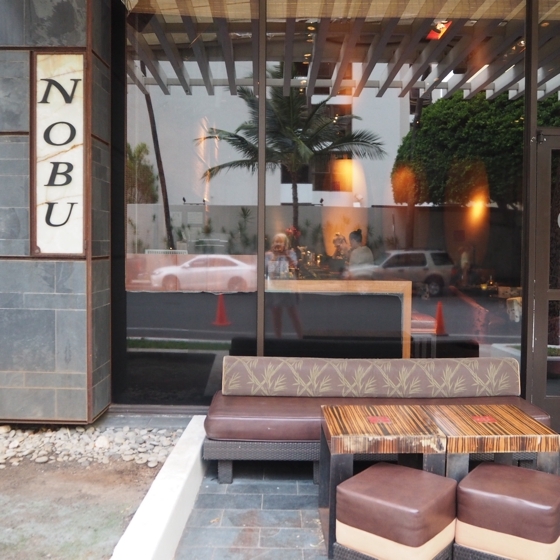 In between the food trucks and Nobu are a tonne of other options for all budgets. The Japanese influence on the culture and cuisine in Hawaii made for beautiful, fresh eating options at every turn. Service is top notch – yes, wait staff work on tips but it was still amazing to be treated so well everywhere we dined. What I also loved was that wine prices on restaurant menus were comparable to Australian restaurant prices – and in some cases cheaper, even for a NZ sav blanc, which has further to travel to Hawaii than to our shores. 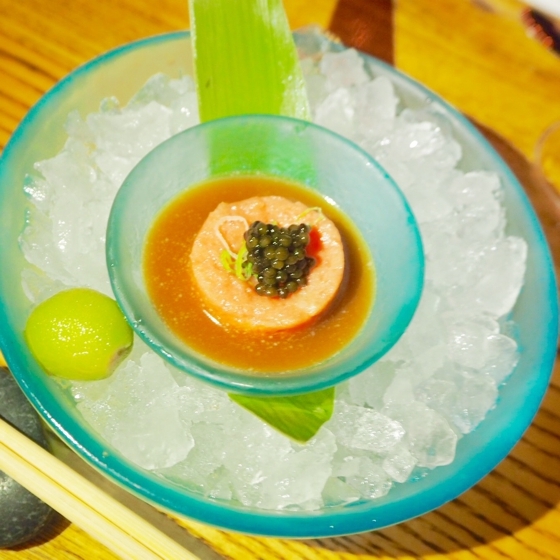 Nobu: simply exquisite Japanese food. We couldn’t decide on the menu so went with a set-course degustation and this ensured we sampled a mix of flavours that will long be etched in my memory. This night is definitely in my top five dining experiences of all times. Morimoto: we lunched here for the view over the harbour from the deck. 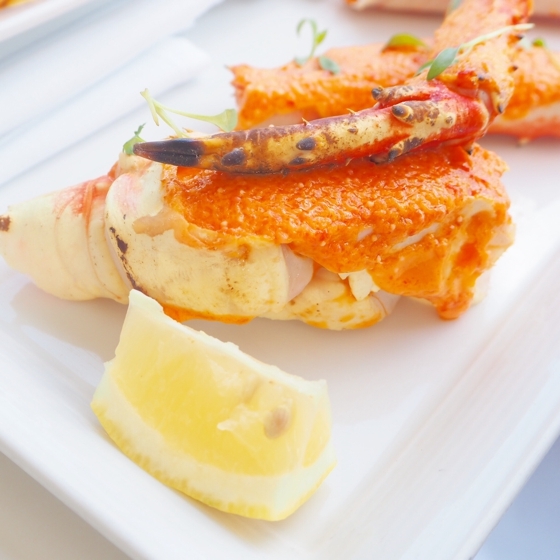 Mr SY will be dreaming about his Spicy Alaskan King Crab for many a day to come. 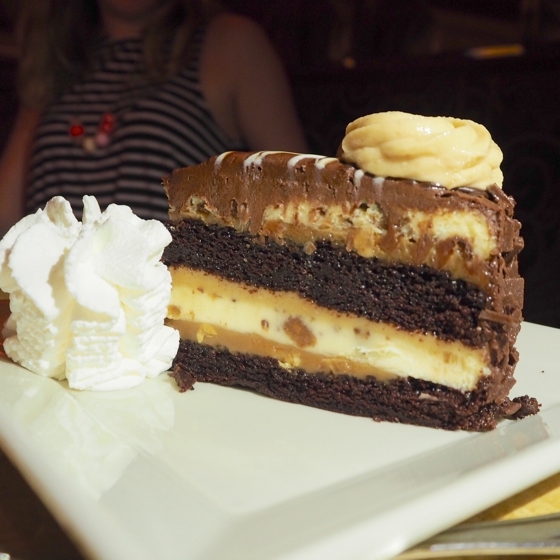 The Cheesecake Factory: this is a chain restaurant in America (that the world knows from TV show, The Big Bang Theory) and on paper it shouldn’t work – the menu is pages and pages long. But good systems and efficient service mean it does. There is literally something for everyone on the menu. 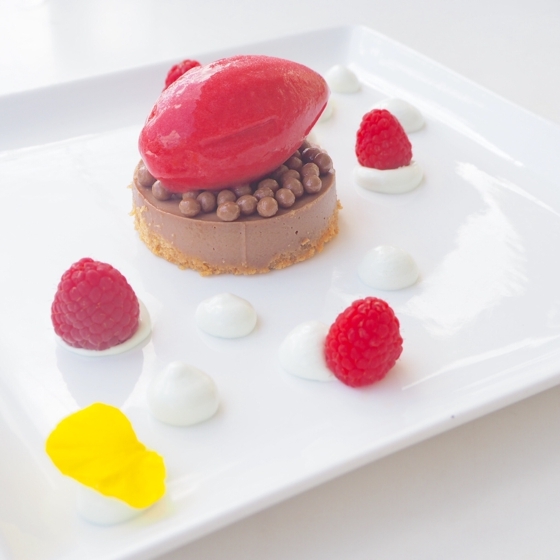 Portion sizes are big so keep that in mind as you will not want to miss ordering a piece of cheesecake to finish. You can’t book a table but arrive early, grab your buzzer and come back around the time they estimate a table will be free. In the interests of optimum time management, we hot-footed it to the beachfront Mai Tai Bar at the Royal Hawaiian while waiting. Duke’s: Everyone told us to eat here and it ended up being our venue of choice for our son’s 21st. Book ahead – you’ll only get a two-hour slot – but this was enough for us to indulge in probably the best salad bar I’ve ever experienced, a main from the menu and the restaurant’s famous Hula pie, a mix of biscuit base, ice-cream, fudge sauce and macadamia nuts that you really do need to share with at least one other. Buho Cocina y Cantina (see above). Delish. Shorebird Restaurant and Bar: This was just downstairs from us on the beach in front of Outrigger Reef. 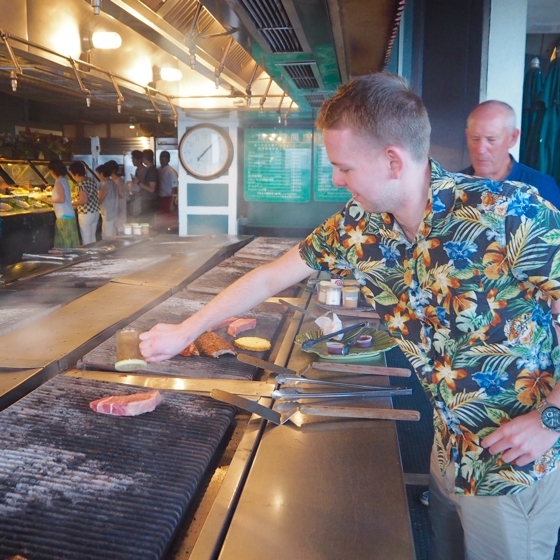 By night it’s all about the grill and you choose what you’d like to have grilled and then cook it yourself – seriously good food and a whole lot of fun. This is a great venue to catch the sunset too. 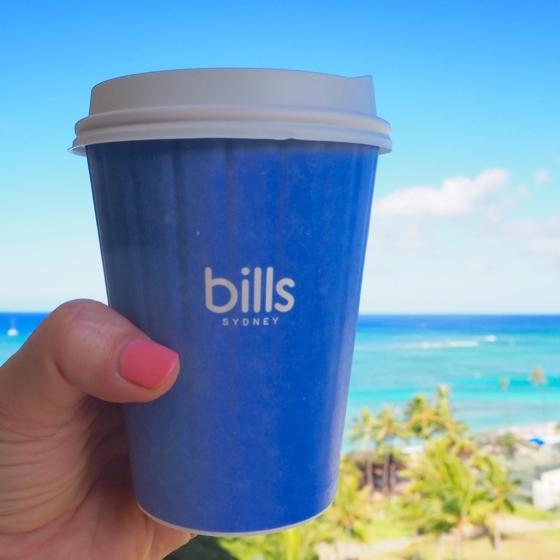 Bills: Bills is the brainchild of Aussie chef Bill Grainger and its Waikiki location was an easy walk for our takeaway coffees most morning. 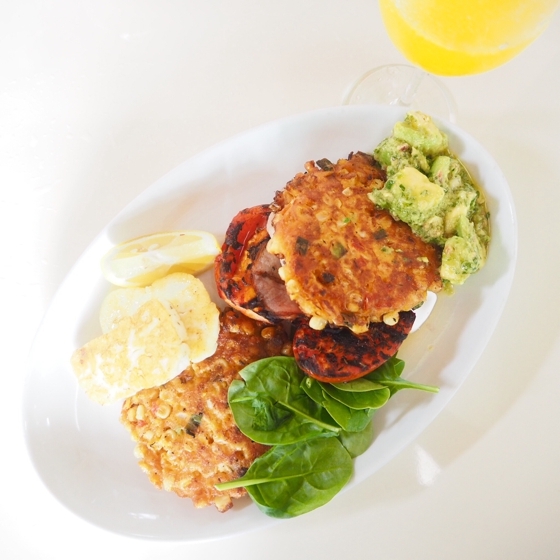 You can dine at Bills for breakfast, lunch and dinner but we couldn’t resist booking for a family breakfast (and some sweet corn fritters!). We lucked a veranda spot too. 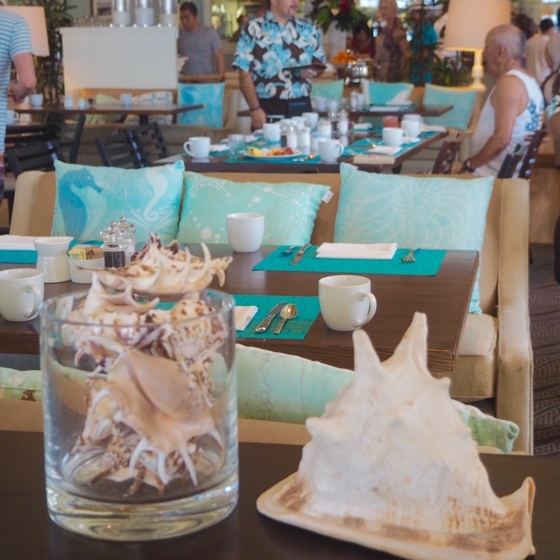 Beachhouse at Moana Surfrider (or the Veranda): a special occasion should start with a special breakfast and that’s what we had at Moana Surfrider. The buffet was up there with the best and we loved that our the omelette, waffle and pancake orders were brought to your table. 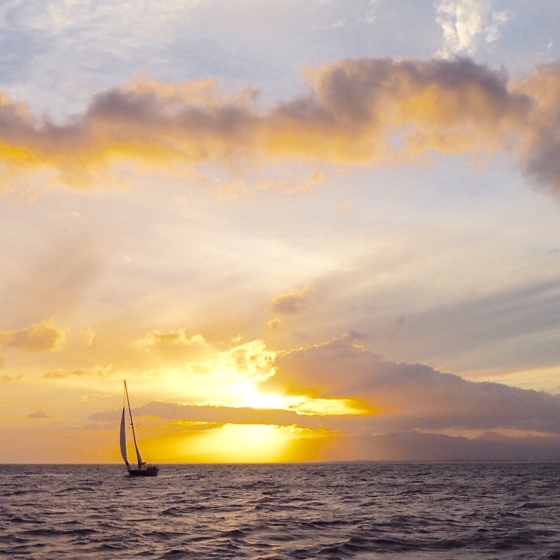 The over-the-water sunsets were pretty spectacular most nights but watching them while on board a catamaran off the coast of Waikiki was something else. Do this on a Friday night and you also get the weekly fireworks as a bonus to the end of the cruise. 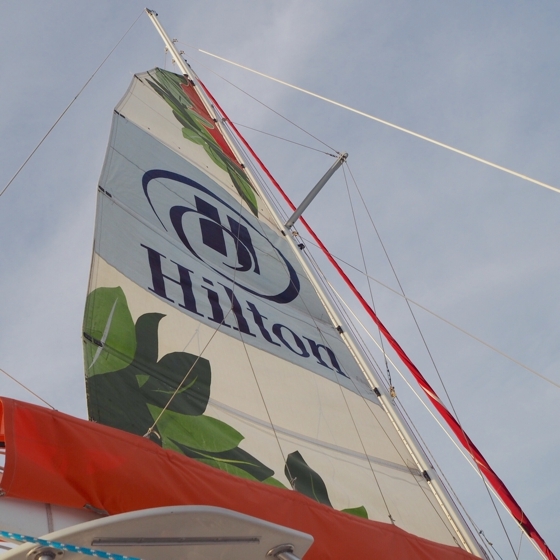 We sailed on the Spirit of Aloha with a very attentive crew, “snacks” (that very much constituted dinner) and drinks for the two-and-a-half-hour duration. We are lucky to have a sunset view from our balcony but grab a vantage point at any spot on the beach and you’ll be treated to a show from Mother Nature. 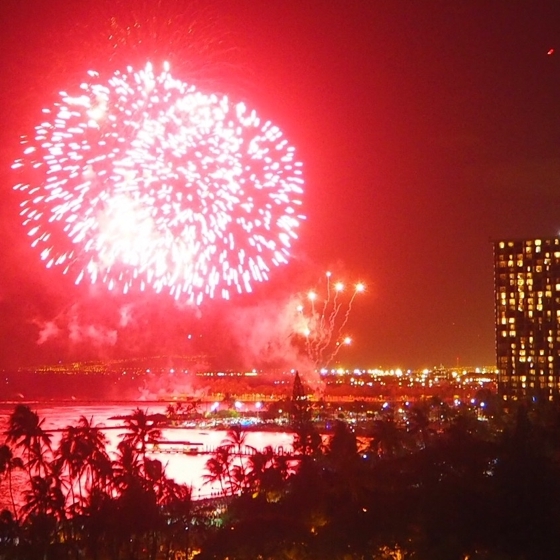 There are weekly fireworks near the Hilton Hawaiian Village every Friday evening. They can be seen from the Honolulu end of Waikiki Beach (or from the water as above). We also got a treat in the Fourth of July fireworks, watching the 20-minute show from our balcony. There are board hire stalls all the way along Waikiki Beach. The two surfers in our family hired longboards from central Waikiki Beach for $US10/hour and had a lot of fun hanging out the back and catching a few easy waves. Me, I had my first go at stand-up paddle boarding (more on that next week). Diamond Head beautifully dominates the landscape at Waikiki and we’d been told that we should do the walk but do it early on a Saturday morning because you can indulge at the farmers’ markets at the bottom when you’re done. This was great advice, as was getting a cab to the base of the walk. It’s about 30 minutes up – it’s not super hard going but there are steep, uneven pathways, steps and a long, dark tunnel to walk through (be mindful of this if you’re claustrophobic). The views are incredible. I chanted Mai Tai all the way up as motivation. I had planned to book a special trip to snorkel with them but it turns out they came to us. Every afternoon right out the front of our apartment. My daughter and youngest son even spent time scratching a turtle’s shell under water (the turtles apparently love it). Hawaiian Tourism Australia hired a car for us (through Alamo) for two days to explore more of the island of Oahu. On the first day we drove to the North Shore and what an absolute treat that was. In less than two hours it felt a million miles from Waikiki, like time had stood still. The beaches were stunning, and there was zero high-rise. The same beaches we swam in were like lagoons but in winter are home to some of the world’s biggest waves and major surfing competitions. 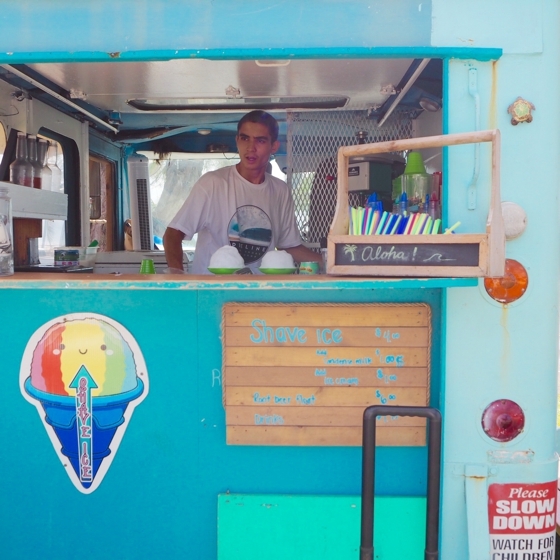 A lunch stop of fried shrimp and shave ice at the food trucks is a must. Want to stay on the North Shore? 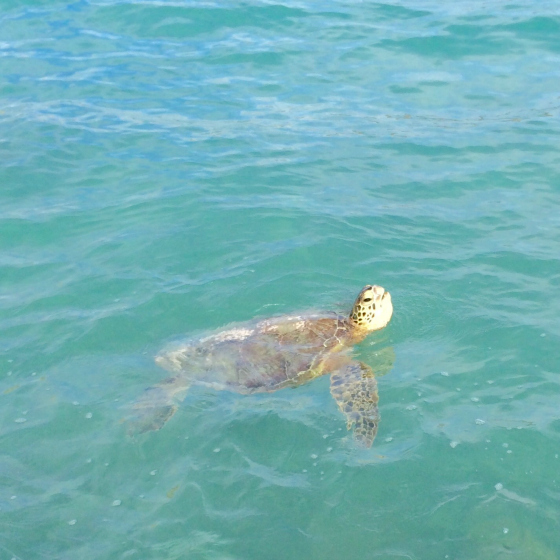 Check out Turtle Bay Resort. 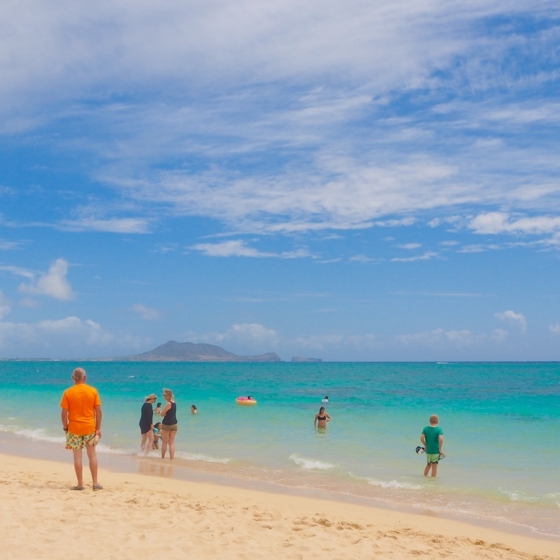 On the second day, we headed east to Kailua and Lanikai beaches. It was windy the day we visited but the beaches here were so beautiful – white sand and turquoise water beautiful. The vibe in Kailua was a whole lot of fun too. We ate burgers at Teddy’s Bigger Burgers and I wandered the shops, finding some super cute boutiques. This area would be a great alternative for a more low-key holiday. Check out holiday home options on Airbnb. All beach holidays should contain an element of this. We purposefully didn’t fill every day as we all needed down time. 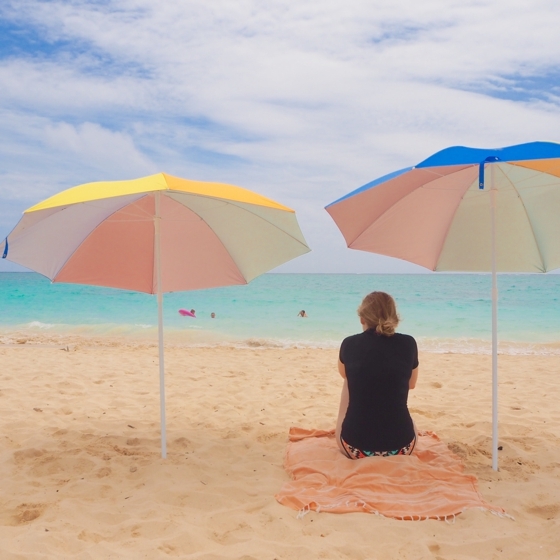 Time spent lying under a beach umbrella, reading a novel or two and taking it all in. Waikiki offers all that and I say lap it up. Can you tell that we absolutely loved our stay? 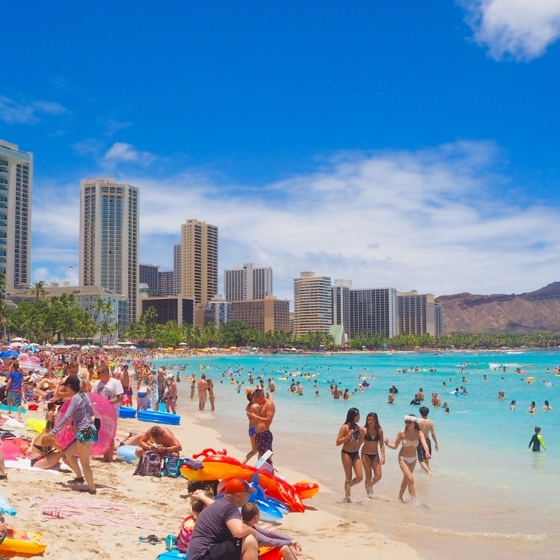 On top of all the things I’ve listed, big pluses for us were the lack of humidity, the fact that we felt safe walking out at night, the way Waikiki is looked after (cleaning and landscaping) and the uber-friendliness of its people. So tell me, have you been to Hawaii? What were your favourite things to eat, do and visit? * Hawaiian Tourism Australia helped organise our Pearl Harbour tours, Spirit of Aloha cruise and car hire. I was a guest or received a discount on these and paid for the others travelling in our party. I was also a guest of the Lather Spa. We booked and paid for our accommodation, airfares and dining options independently. Thanks! Enjoyed the read, heading to Waikiki from the Gold Coast in a few weeks so could relate haha! Love this! I can’t wait to go to Hawaii one day. omg brings back such great memories. I want to go back. We went for the first time Jan 15. We stayed 7 days which wasnt long enough. The place the people the shopping Loved every minute of it. Years since I have been to Hawaii. Way back in my 20’s. Even then many of your recommendations were the things to do. Shopping was a must. Especially at sale time. My most favourite memory is all the costumes at Halloween. It was a non event in NZ at the time so to see guys dressed up as Dianna and the Supremes, singing in the street make an everlasting memory. 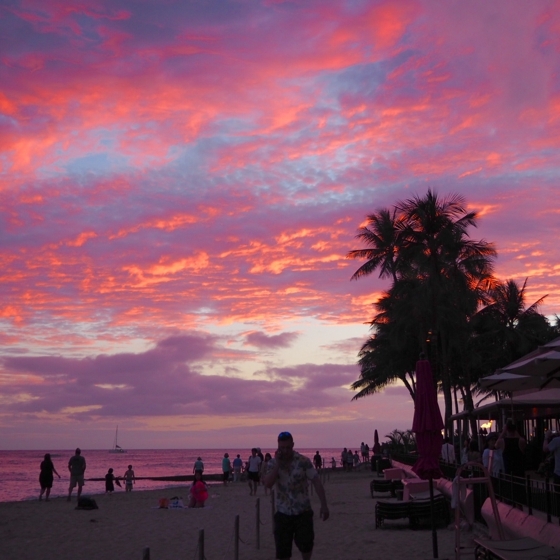 Thank you Nikki for sharing your pics and tips on your Hawaiian holiday,it looks so beautiful! Oh I loved following you and Kirsten on IG…am overwhelmed in a good way with all the brilliant info, thank you so much…bookmarked everything and will check in again later when my excitement settles . Look forward to SY community contributions before my trip in Oct. Yes, bookmark and come back closer to the trip Cheekie … included a lot of detail so that it’s useful to people going … the stuff I always want to know! I went to Hawaii twice in the late 80’s so it’s about time I went again! My husband, after 30 years in the navy and as well traveled as he is, has never been so perhaps I need to put it on the list! Great post Nikki as always! We are heading to the UK and Paris in six weeks so I am busy reading your previous posts on what to pack! Yes, time to go back but first UK and Paris. That will do just nicely! 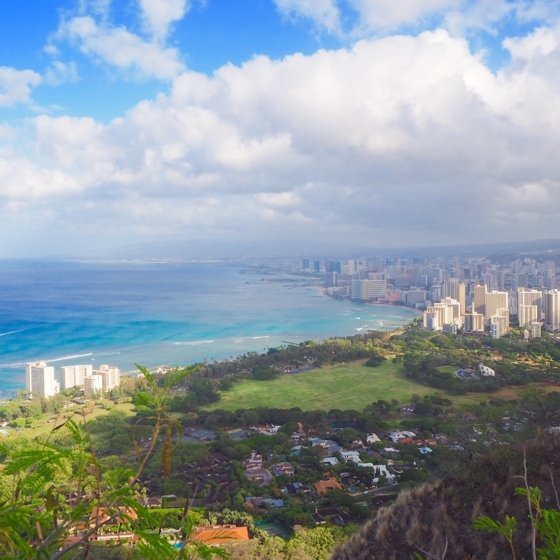 I’ve been lucky enough to go to Hawaii/Oahu twice (am about to go back for a 3rd time in September, en route from San Francisco & before stepping on a cruise home), but there’s some places/things in here that I didn’t know about, so thanks for the round up! 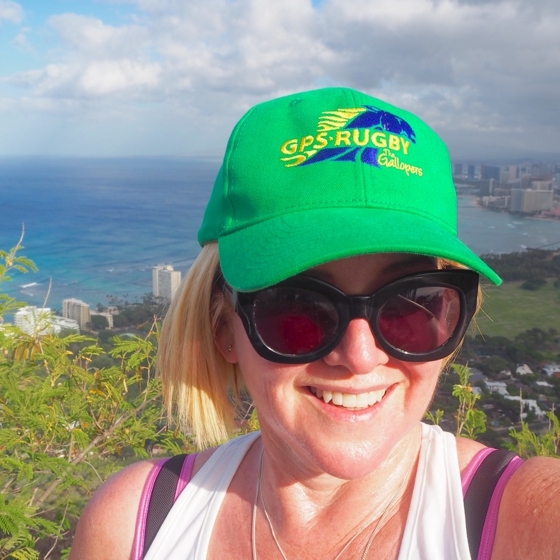 Definitely looking to climb Diamond Head, but I’ll be flying in on a Saturday, so I’ll miss the markets sadly. Funnily enough, I’ll be staying at The Modern (with my folks) whilst in Honolulu this time – judging from the pictures, it looks quite nice. Might consider a spa treatment, provided I haven’t done my dough shopping! Oh you’ll love staying at The Modern Shell … and the climb is great for the view and perspective over Waikiki Beach. Snorkelling at Hanauma Bay is a must. You need to book a tour to get there, but the coral and sea life is so close to the shore that even the most novice snorkeler will enjoy it. Also the bar Rumfire in the Sheraton complex is great for chilled out live music and tapas when the whether is crappy. We missed out Julia as the carpark was full by 9am on our drive across to the east – will do next time! And yes,the Rumfire bar was great. Cocktails fantastic – just wanted to be in the pool drinking them! It’s four years since we were on the mainland US, Vanessa … I’d say though comparable prices and the same ability to high-low it depending on budget or how you like to mix it up. Re accommodation, we travelled at a peak time (Australian and US holidays plus Fourth of July) so premium prices but booked the apartment a year ago through Last Minute for about $500/night – for 4 adults/1 kid this was good value for this time of year. If you can go in a low season (we can’t because of school), it would be a much cheaper opposition. 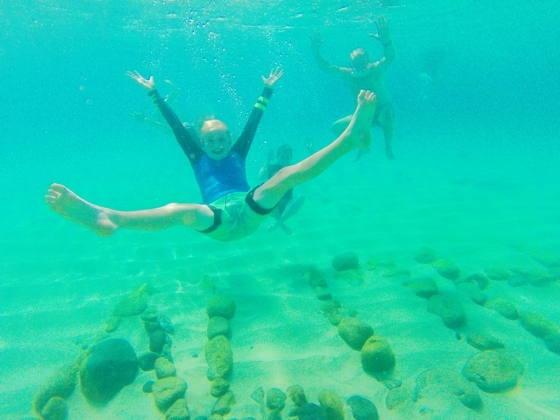 A mum from school who we met up with priced the Moana Surfrider for Easter next year and found that it was cheaper than the Noosa accommodation they usually book! I think the Shenanigans clan would very much enjoy Hawaii! It was only about 20 minutes to walk there too – we cabbed over so fresh for lunch but easy stroll back past the Hilton Village. We’ll be going back – not sure if next year. Did you hear about our building getting demolished in 2018? Sad face!